Love 'em or hate 'em, you have to hand it to any spider that manages to survive more than four decades without getting stomped or swatted to death. That's why it's with a heavy heart that we pass along the sad news that the world's oldest spider has died at the ripe old age of 43. Of course, this probably isn't all that sad if you hate spiders. 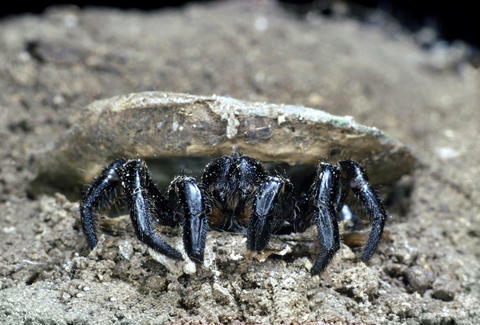 The spider, born during the Ford administration and a good 15 years before the film Arachnophobia hit theaters, was a female Gaius Villosus trapdoor spider known by the name Number 16. She lived in a single burrow in Australia for her entire life, which allowed her to remain protected and expend the minimum energy necessary, per a report by The Telegraph. However, she unfortunately didn't die of old age, but rather succumbed to the effects of a parasitic wasp attack. The oldest known spider before Number 16 was a tarantula in Mexico, which died at 28. Unlike tarantulas, trapdoor spiders aren’t that big, and generally measure between just 2.5 to four centimeters long. They aren’t deadly, either. And while humans may encounter a male Gaius Villosus on occasion, females pretty much stay put in the same place their entire lives. In fact, they rarely venture more than a few meters from where they’re born, hunkering down in their burrows. They also normally only live to be around 20-years-old. “To our knowledge this is the oldest spider ever recorded and her significant life has allowed us to further investigate the trapdoor spider’s behavior and popular dynamics,” said Leanda Mason, a doctoral student at Australia’s Curtin University, who published a report on the death of the spider in the Pacific Conservation Biology Journal. RIP Number 16, and thank you for not being as terrifying as some of your fellow eight-legged Australians.